9-1-1 is the “Universal Emergency Number” used throughout the U.S.A. When the 9-1-1 operator receives a call they ask questions to determine the nature and location of the emergency, then send the appropriate first-responders to the emergency location. An emergency is when you or someone else may be seriously hurt or in immediate danger. Knowing when to call 9-1-1 is important, because unnecessary or inappropriate 9-1-1 calls can cause delays in responding to other emergency calls. CALL 9-1-1 if you need a policeman, a fireman or an ambulance. DO NOT CALL 9-1-1 if you have a question, a complaint, need a house check or need someone to settle a disagreement. For non-emergency calls, dial 810-732-9911. How do I call 9-1-1? First, get to a safe place to make the call. If where you are isn’t safe – get away – then call. Dial or press the numbers 9 then 1 then 1. On a cell phone, press “Send”. Stay calm so that you can speak clearly. When the operator answers, describe your emergency, and give the location (street address, intersection or other landmarks) of the emergency. Stay on the line and follow the operator’s instructions. Don’t hang up until told it’s OK to do so. Stay by the phone in case the operator needs to call you back for more information. What if I’m deaf or cannot speak? Genesee County residents can text 9-1-1 from a cell phone. Send brief messages without using abbreviations or slang. Be prepared to communicate your exact location and the emergency help that is needed. Stay with your cell phone and be prepared to answer questions and follow instructions from the 9-1-1 dispatcher. Even if you are unable to speak, by calling 9-1-1 you should be able to get help. After you dial 9-1-1, do not hang up. Make any noise you can. 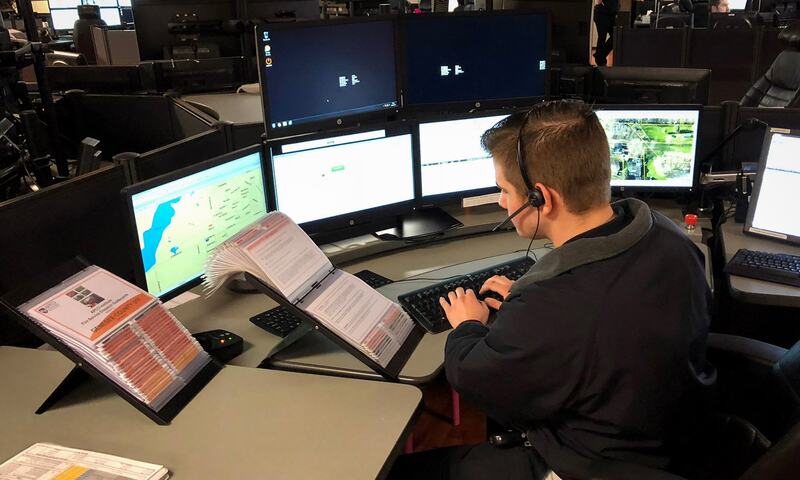 With Enhanced 9-1-1, the operator should be able to get your address if you’re on a landline; with a cell phone, you could be located by the location of the cell tower receiving your transmission. What if I (or my child) accidently calls 9-1-1? Do not hang up. If you hang up and the operator believes you are in danger, they will send the police. Simply tell the operator you dialed 9-1-1 by accident, then wait for them to tell you what to do next. When you call 9-1-1, your call is answered by an Emergency Call Operator. It is then routed to the appropriate agency. Approximately 75% of the calls per month that come into 911 are for the police. The remaining calls are routed to the ambulance and fire departments, the Crisis Center, and the Poison Control Center.